Forest management has shifted from a relatively narrow focus on commercial wood supply to greater consideration of the natural dynamics and multiple ecological services provided by forest ecosystems. This recognition has generated interest in ecosystem management approaches based on diversifying and adapting silvicultural practices such as partial harvesting. 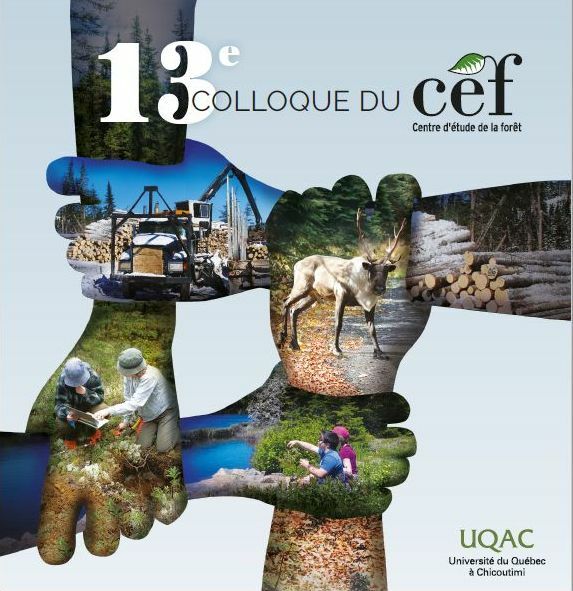 The SAFE (sylviculture et aménagement forestier écosystémiques) project is a series of stand-level experiments undertaken in the Lake Duparquet Research and Teaching Forest (LDRTF) in the south-eastern Canadian boreal forest. The project was initiated in 1998 and tests the potential of partial harvesting as a tool for ecosystem-based silviculture in trembling aspen (Populus tremuloides Michx.) dominated stands. Previous studies conducted across the Canadian boreal mixedwood forest have indicated that, over the short term, partial harvesting of aspen or mixed-aspen stands can initiate a second cohort of aspen, increase the growth rate of advanced conifer regeneration and maintain most of the structural attributes of mature stands. Over the longer term (12 years), I expected that, following partial harvesting of 50% or more of basal area or through the use of gap harvesting, residual stems would be more susceptible to mortality due to windthrow compared to lighter harvesting prescriptions. This in turn would favor a progressive opening of the canopy, increase canopy gap size and change the dynamics between commercial and competitive species, thus potentially generating a shrub-dominated community. I also expected that more intense partial harvesting prescriptions would accelerate the growth of residual trees by decreasing competition and increasing resource availability as well as accelerating the development of old growth stand attributes by creating growing space for new tree cohorts. This thesis is structured around four individual studies conducted in the SAFE project. The first and second studies were conducted in pure aspen stands (93% aspen basal area) while the third and fourth studies also used data from mixed aspen stands (81% aspen basal area). In the first study, we evaluated the effects of partial harvesting on sapling recruitment and residual tree mortality over a twelve year period. Stem analysis and neighborhood competition indices were used in the second study to assess tree-level growth responses over the same period. For the third study, we first identified and characterised, based on the literature, the structural attributes of old-growth trembling aspen (Populus tremuloides Michx.) - dominated stands for boreal mixedwoods. Using inventories conducted in pure aspen and mixed aspen stands, we then assessed the potential of partial harvesting in even-aged aspen-dominated stands to accelerate stand development towards these old-growth attributes. Finally in the fourth study, SORTIE-ND - a spatially-explicit stand dynamics model - was adapted and validated for the region and stand development under a range of partial harvesting scenarios was simulated over a 100-year period. The effects of partial harvesting on stand dynamics over a twelve-year period were compared among four treatments: clearcuts (100% basal area (BA) removal); 1/3 partial cut (1/3 PC, 33% BA removal using low thinning); 2/3 partial cut (2/3 PC, 61% BA removal using high thinning) and controls (0% removal). Aspen sapling recruitment increases continuously following clearcut and partial cut treatments and no significant mortality occurred in the sapling layer over the 12-year period. Aspen sapling recruitment was disproportionally greater in the 2/3 partial cuts (56% of aspen sapling density in clearcuts) compared to the 1/3 partial cuts (5% of clearcut densities). Recruitment of conifer saplings increased with time and was significantly higher in the two partial cut treatments than in the clearcut treatment. Mortality of residual merchantable aspen was strongly associated with small stems (10-19.9 cm DBH), regardless of treatment but was initially (1-3 years after treatment) higher in the 2/3 partial cut. Both partial harvesting treatments had the effect of maintaining mountain maple (Acer spicatum Lamb. ), a shade-tolerant, high woody shrub, at densities similar to those in control stands, whereas recruitment of mountain maple saplings was negligible in clearcuts. Annual volume increment (AVI) of individual aspen stems was analyzed as a function of treatment, tree social status, pre-treatment growth, time since treatment application (1–12 years) and neighborhood competition. There was no evidence of initial growth lag after partial harvesting. Only the most severe treatment of partial harvesting (2/3 PC) resulted in an increase in volume increment relative to trees in control stands. Annual increase in volume in the 2/3 partial cut was 25.6% higher than controls over 12 years. Annual volume increment of dominant trees was higher by 16.2 dm3yr-1 than that of co-dominants and was proportional to pre-treatment volume growth. Based on a literature review, it was determined that compared to mature, even-aged stands, old-growth aspen stands have lower merchantable stem densities and basal area, more large aspen stems and higher stem size variability, more than one cohort of trees, greater percentage area occupied by gaps and more and larger snags and downed wood. Inventories conducted over a 12-year post-treatment period indicate that while the partial harvesting treatments applied in this study successfully retained most of the structural attributes of mature aspen stands (untreated controls), they did not generally “accelerate succession” toward old-growth in the 12-year time interval. Nonetheless, overall results do suggest that by promoting irregularities in both horizontal and vertical structures, high-intensity partial harvesting will accelerate stand development towards what could be characterised as old-growth aspen-dominated mixedwoods. The results of simulations with SORTIE-ND indicate that following the mortality of the first cohort of aspen, white spruce (Picea glauca [Moench] Voss) maintained dominance in un-harvested controls of pure aspen stands whereas balsam fir (Abies balsamea (L.) Mill.) dominated in mixed aspen stands. All gap cuts and 80% dispersed cuts favoured recruitment of aspen over conifers. At year 100 of simulation runs, the 1,600 m2 gap cut resulted in highest stand basal areas in both pure aspen and mixed aspen stands with 38.0 and 34.1 m2.ha-1, respectively, of which 18% and 28%, again respectively, was composed of tolerant conifers. The overall results of the thesis indicate that partial harvesting is a viable silvicultural option for trembling aspen-dominated boreal mixedwoods of Eastern Canada. This practice can be used to improve the growth of large aspen trees and to promote old-growth attributes. However, residual tree mortality immediately after treatments applied in this study and limited conifer recruitment bring into question the general potential of partial harvesting in these stand types. I argue that adapting partial harvesting treatments (intensity and spatial configuration of tree removal) based on pre-harvest stand conditions (e.g. stand age, stem size distribution, presence of conifer seed trees and advanced regeneration, and presence of woody shrubs) is the key to ensuring success of partial harvesting treatment. There has been some debate surrounding absolute retention levels to be applied in partial harvesting; however, modelling results suggest that both stand structure and timber production rates are strongly influenced not only by retention levels but also by spatial configuration of residual trees. La gestion des forêts est passée d’une dynamique productiviste visant principalement l'approvisionnement en bois commercial à une meilleure intégration de la dynamique forestière naturelle et des multiples services écologiques des forêts. Cette évolution s’est traduite par des approches d’aménagement écosystémiques qui préconisent la diversification et l’adaptation des pratiques sylvicoles incluant le recours à des coupes partielles. Le projet SAFE (sylviculture et aménagement forestier écosystémiques) comprend une série d'expériences sylvicoles conduites l’échelle du peuplement en forêt boréale mixte de l’Est canadien. Le projet, initié en 1998 dans la forêt d’enseignement et de recherche du lac Duparquet, vise à valider le potentiel sylvicole des coupes partielles appliquées à peuplements équiennes matures dominés par le Peuplier faux-tremble (Populus tremuloides Michx.). Des études antérieures menées en forêt boréale mixte canadienne indiquent qu’à court terme la coupe partielle appliquée à des peuplements purs ou mélangés dominés par le P. faux-tremble initie une deuxième cohorte de P. faux-tremble, augmente la croissance de la régénération résineuse préétablie et maintient la plupart des attributs structurels de peuplements matures. J’ai émis l’hypothèse que, sur le plus long terme (12 ans), la mortalité les tiges résiduelles due à la chablis serait plus élevée après un prélèvement de 50% ou plus de la surface terrière (ST) ou suite à une coupe par trouées comparativement à un prélèvement moins fort. Cette mortalité favoriserait l’ouverture progressive de la canopée, augmenterait la dimension des trouées et altérerait la dynamique entre les espèces commerciales et concurrentes, favorisant ainsi la strate arbustive. J’ai aussi émis l’hypothèse qu’un prélèvement plus élevé permettrait d'accélérer la croissance des arbres résiduels en diminuant la compétition et en accroissant la disponibilité des ressources et permettrait aussi d'accélérer le développement des attributs structurels caractéristiques des peuplements plus âgés ou anciens en créant l’espace nécessaire à l’établissement de nouvelles cohortes d'arbres. La thèse est structurée autour de quatre études individuelles menées dans le projet SAFE. Les première et deuxième études ont été réalisées dans des tremblaies pures (93% de la surface terrière en P. faux-tremble) tandis que les troisième et quatrième études ont également utilisé les données de peuplements mixtes dominés par le P. faux-tremble (81% de la surface terrière). Dans la première étude, nous avons évalué les effets de la coupe partielle sur le recrutement des gaules et la mortalité des arbres résiduels sur une période de douze ans. Des analyses de tige et des indices de compétition à l’échelle de l’arbre ont été utilisés dans la deuxième étude afin d’évaluer, pour la même période la croissance en volume des tiges résiduelles en réponse au prélèvement. Pour la troisième étude, nous avons identifié et caractérisé, à partir de la littérature, les attributs structurels caractéristiques des vieux peuplements de P. faux-tremble de la forêt boréale mixte. À l’aide d’inventaires nous avons évalué la capacité de la coupe partielle appliquée à des peuplements équiennes matures d’accélérer le développement de ces attributs. Enfin, dans la quatrième étude, SORTIE-ND - un modèle spatialement explicite de la dynamique des peuplements - a été adapté et validé pour la région. Par la suite, nous avons modélisé la dynamique des peuplements en simulant une gamme de coupes partielles de différentes intensités et selon différents patrons spatiaux. La dynamique des peuplements a été caractérisée pendant 12 années suivant l’application d’une coupe totale, d’une éclaircie par le bas de 33 % (CP1/3) de la surface terrière (ST), d’une éclaircie par le haut de 61 % (CP2/3) de la ST et dans des peuplements témoins non coupés. Au cours des 12 années suivant la coupe, le recrutement des gaules de P. faux-tremble a augmenté progressivement et de manière proportionnelle à la ST prélevée, sans mortalité significative des gaules. Douze ans après la coupe, les CP1/3 et CP2/3 généraient respectivement 5% et 56% des densités de gaules retrouvées suite à la coupe totale. Le recrutement des conifères augmentait aussi dans le temps et était significativement supérieur dans les coupes partielles que dans la coupe totale. Initialement (1–3 ans après coupe), la mortalité du P. faux-tremble reflétait principalement celle des petites tiges marchandes (10–19.9 cm DHP) et la mortalité relative la plus importante était associée à la CP2/3. L'accroissement du volume annuel (AVA) des tiges individuelles a été analysé en fonction du traitement, du statut social de l'arbre, de la croissance prétraitement, du temps écoulé depuis l'application du traitement (1-12 ans) et de la compétition par les arbres voisins. Il n’y avait aucune évidence de la stagnation de la croissance initiale après l’application des CP. Seule la CP2/3 a entrainé une augmentation de l’accroissement en volume comparativement aux arbres des peuplements témoins. Sur une période de 12 ans après coupe, l’AVA des tiges individuelles dans les CP2/3 était 25.6% plus élevé que celui des arbres des témoins. L’AVA des arbres dominants était plus élevé de 16.2 dm3.an-1 que celui des co-dominants, et était proportionnel à la croissance prétraitement. Suite à une revue de la littérature, il a été établi que comparativement à des peuplements équiennes matures, les peuplements anciens de P. faux-tremble ou mixtes sont caractérisés par une densité et une surface terrière en tiges marchandes inférieures, plus de trembles de forte dimension et une plus grande variation de la taille des tiges, plus d'une cohorte d'arbres, une plus grande surface occupée par les trouées d’arbres et des touées élargies plus grandes et des chicots et débris ligneux au sol plus abondants. Les résultats indiquent que les coupes partielles spécifiques à cette étude aient réussi à conserver la plupart des caractéristiques structurelles des peuplements de trembles matures (contrôles non traités). Cependant au cours des 12 premières années après coupe, elles n'ont pas "accéléré la succession" vers des peuplements anciens. Cependant, les résultats suggèrent qu’en créant plus d’irrégularités dans la structure horizontale et verticale des peuplements, une coupe partielle de haute intensité permettra d'accélérer à plus long terme le passage des peuplements matures équiennes vers un stade plus avancé caractéristique des peupliers faux-tremble âgés de la forêt mélangée. Les simulations réalisées à l’aide de SORTIE-ND projettent qu’après la mortalité de la première cohorte de P. faux-tremble, l’épinette blanche (Picea glauca [Moench] Voss) dans les peuplements non exploités de P. faux-tremble, et le Sapin baumier (Abies balsamea (L.) Mill.) dans les peuplements mixtes, deviennent dominants. L’ensemble des traitements par trouées et le prélèvement de 80% de la ST favorisent le recrutement du P. faux-tremble aux dépens des conifères. Après des simulations avec des pas de temps de 100 ans, la ST des peuplements est maximale à la suite d’un prélèvement par trouées de 1600 m² soit 38.0 m2.ha-1 dans les peuplements de P. faux-thermale et 34.1 m2.ha-1 dans les peuplements mixtes, avec respectivement, 18% et 28% en conifères tolérants à l’ombre. Globalement, les résultats indiquent que le coupe partielle appliquée à des peuplements équiennes matures dominés par le P. faux-tremble est une option viable en forêt boréale mélangée de l’Est canadien. Cette pratique peut être utilisée afin d’améliorer la croissance des gros trembles et aussi pour promouvoir certains attributs des peuplements plus âgés. Cependant, la mortalité des arbres résiduels immédiatement après les traitements et le recrutement limité en conifères remettraient en question le potentiel de la coupe partielle. Je soutiens que l'adaptation des prescriptions de coupe partielle (intensité et la configuration spatiale) aux conditions des peuplements avant récolte (par exemple : l'âge et la distribution diamétrale du peuplement, la présence d’arbres-semenciers et de régénération préétablie d’espèces conifères, l’abondance des arbustes ligneux) est la clé la réussite du traitement. Les enjeux relatifs aux coupes partielles ont longtemps touché aux taux et temps de rétention des arbres résiduels. Cependant, nos résultats démontrent que la structure des peuplements et la production de matière ligneuse sont influencées non seulement par les taux de rétention, mais aussi par la configuration spatiale des arbres résiduels.